The Deer Creek Trail extension has been effectively cancelled by Great Rivers Greenway after delays by the City of Maplewood in approving the project jeopardized a federal grant of $1.5M awarded to GRG to construct the project. The project had been slated to begin construction as early as fall of 2018 before the decision this week to return the federal funding and re-allocate another $1.6M in local GRG funding to other projects. 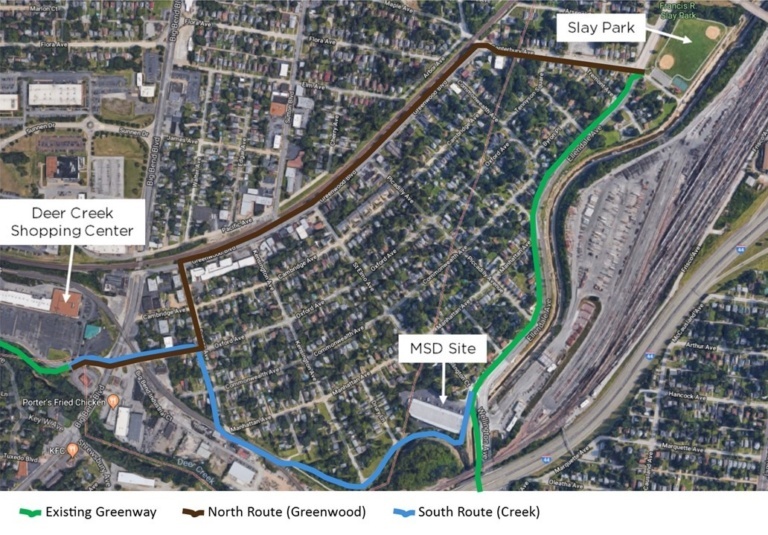 The 1 mile trail connection would have been built in both the City of St. Louis and the City of Maplewood, connecting the existing River Des Peres Trail to the existing Deer Creek Trail which runs through Maplewood and into Webster Groves. The trail alignment would have run along Canterbury Ave. in St. Louis and Greenwood Blvd. in Maplewood, before crossing Big Bend Blvd. and connecting to the existing trail adjacent to the Deer Creek Shopping Center. Construction of the trail, a piece of GRG's planned region wide trail network, was at no cost to either city. Brown line indicates preferred trail route. Both the City of St. Louis and Maplewood had previously supported the federal grant application, which matched GRG's local funding commitment to the project that would have rebuilt a substantial section of Canterbury and Greenwood. This month, GRG was already beyond a federal deadline to show progress on the project, waiting for a Maplewood decision to bless the route alignment. A disagreement among Maplewood City Council members about the trail route and specific details of the project delayed approval. This week the City of Maplewood sent a letter to GRG, with a list of demands and stipulations they required to move forward. Certain details like the width of the trail and the width of the parking lanes on Greenwood Blvd. were points of contention. But more critical were demands made by Maplewood that would have added substantial cost and time to the project, putting it well over the $3M budget allocated for the 1 mile trail. 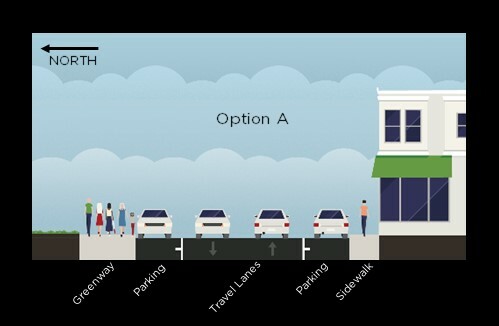 Maplewood insisted on re-grading Greenwood Blvd and wanted the addition of an underpass to cross Big Bend Blvd., which would have been cost prohibitive. Faced with demands by Maplewood that would have added potentially over $1M to the project, and up against a deadline, they chose to return the grant money rather than face an unfeasible project they could not complete on budget, and be punished on future federal grant applications for not completing this project. A typical cross section on Greenwood Blvd. Returning a federal funding award is extremely rare for any agency. GRG has completed trail projects across three counties in a variety of municipalities over 18 years and has never returned an award before. The project cancellation is a major blow to the promise of a connected trail system linking the southwest border of the City to trails into south St. Louis County and inner ring suburbs. It is also an example of the regional fragmentation of local government that makes completing projects across jurisdictions difficult, and in this case, impossible. The outcome is $3M in funding that would have gone to this area to create a new trail amenity, as well as upgrade traffic signals and crossings for vehicular and pedestrian safety, will be reprogrammed to another part of the region. There is no schedule to reconsider the project, but the dynamic of applying for funding twice for the same project means it will likely be many years into the next decade. Officials in St. Louis report being uniformly frustrated and disappointed that a project they had invested time in planning and supporting is now cancelled by a neighboring jurisdiction.